Andrew Bowler, Academy Award nominated filmmaker and writer-director of Time Freak, sat down with DVD Talk writer and film critic Neil Lumbard to discuss his latest feature film effort: the zany, romantic, and comedic science fiction extravaganza called Time Freak (starring X-Men: Dark Phoenix actress Sophie Turner and Miss Peregrine's Home For Peculiar Children star Asa Butterfield). With a discussion ranging from the origins of the story to discussing the essential question of “what's the best time travel film of all time?” this DVD Talk interview is an insight into filmmaker Bowler's vision and drive as a creative individual. First of all, I know you shot a short film entitled Time Freak back in 2011.Was that the original origin of the story? Yes, the original idea was that my wife and I were planning to make a short film. We assembled a filmmaking team and decided to use it as a building block for a career. That is how this started. It was nominated for an Oscar and then it became this feature. That's awesome. When did you have the idea to turn this short film into a feature film? How was that process in to developing this? I think I always thought it might be a good idea for a feature. Obviously, the more successful the short got the more it turned into a career opportunity. I always thought it could be that [a feature]. It ultimately kicked in when we won at a bunch of festivals and then got the Academy Award nomination. The idea was to turn it from a story about a guy who neurotically relives his day to a guy who neurotically relives his relationship. That was probably the primary difference. The whole focus of the story. That's interesting. What inspired you to make this as a story? Was there any particular inspiration? You know, I connect a lot with the idea of regret which comes from the short. I think it [the short] was funny and spoke to me. I think people's reactions to it inspired me the most. I couldn't believe how many people came up to me after film festivals and said “that's exactly what I would do with a time machine!” I was continually surprised by how universal this idea of regret was. I started to realize that so many people relate to that. So when we started making the feature that became the important thing. We struck some chord with that short that people related to. How do we keep that alive in some way? So when people watch the feature they might have the same feeling. I'm not as interested in being clever or being tricky with the time travel as much as I am interested in hopefully creating some kind of human connection with the concept of regretting something. Do you think that's one of the main things that draws people to time travel stories? What are others reasons you think people might be so drawn to time travel? I think it's control. I think it's escapism. 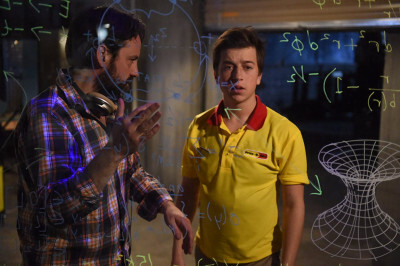 If you're talking about immediate time travel, you're talking about control. You're talking about “Oh, I could have everything I want in life if I could go back in time and do some things differently now.” The moral of both movies is that it doesn't quite work that way. I think it's also a honest way of trying to escape the very nature of our world. That's an excellent answer. What would you say is the greatest challenge you have had in bringing this story to life? You know, the biggest challenge is that you got to get funding for a movie like this. I was lucky enough to get hooked up with Ray Mansfield, a producer at DC entertainment. He did Get Out and Blackkklansman. They have the funds to finance this movie. They have their partners to get this movie made. They were also responsible for creating a cast that is going to allow this movie to make sense out of what is in this space. They have to be responsible producers. It's a case of reading the script and saying “Yeah, I'd like to do it and I have a hole in my schedule and we have to get the process moving.” That's the biggest challenge. There's a bunch of creative challenges every day. You're really talking about a script that you have, that you like, that you feel comfortable that you can direct. The biggest challenge is: is someone going to pay to get it made? That's awesome. On that note, I've written a time travel script. It's a spec script that I hope to get to direct eventually. It's kind of an honor just to chat with you. Well, the thing is, that's the journey right? It's like you work and you work and that's the internal journey. If I can make this something good for me. If I can make this something that I'm proud of. When you pass that threshold and you feel comfortable about it then now you have to face that it's then up to other people. So, good luck to you! Thank you, sir. 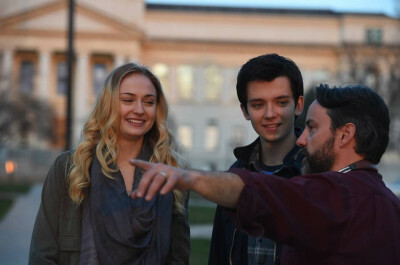 What would you say it was like working with Asa Butterfield and Sophie Turner? They are super duper pros. If you look at all three pros in our cast (in a very talky movie with a tight schedule) all were 20 or under and that was a lot of responsibility for them on set. This movie could have gone any way they wanted but the way it went it went as smooth as possible with the three most responsible people you'll ever meet. They show up every day ready to work. They are team players. That leadership that you get on set with your three main cast members... knowing the script, knowing it cold, and bringing their ideas and soul: bearing and exposing themselves [to the project]. Sophie sang and showed a side of herself that I'm not sure she was particularly comfortable with at the time but that honesty and courage and leadership is what sets the tone for a great creative experience like we all had. That's excellent. I thought they were all really excellent in the movie. I really enjoyed their performances. They brought a lot to the story. Since it's a time travel film, my next question might not surprise you. What's your favorite time travel film of all time? And why is it your favorite? I think the granddaddy is Back to the Future. I think the reason that's my favorite is that back when I was a kid in middle school I walked like Michael J. Fox and had a speech pattern like Michael J. Fox and so around the time that movie came out I even watched Family Ties. One hour with no commercial interruptions. That to me is the big one. But as you get older you transition from the star power that Michael J. Fox has to appreciating the film. The script is perfect. It is a perfect script. There is not a hair out of place in that movie. We should all aspire to even come close to that. I couldn't agree more. Actually, it's my favorite film of all time. From the first time I watched it. I've watched it so many times over the years. It's perfect. I was curious about the title. I was curious about the title of the film being Time Freak. I almost felt like the title was a synonym for maybe being a control freak. Butterfield's character gets more and more obsessive over the story in trying to fix things. Was that intentional? I didn't plan that but if you don't mind, I'm going to steal that. I like it, I like it! It came off of the short. We wanted to create some kind of continuity with the feature. It just kind of fit. But, yeah, there are many people who “freak” throughout this movie so choose who it is. Yeah, that's true. How did you juggle matching all the different tonalities in the story? Bringing humor with romance and science fiction? I told everybody in the big production meeting we did at the beginning, as you will see someday, that with the production heads you will go over every single page of the script. We made an announcement to everybody about the cast, the costumes, the color correcting at the end... we are making a grounded movie. The fact that there is time travel in the movie is not license to let other things drift away. Everything stays grounded. Including the time travel. It's an interesting thing that doesn't actually happen. A post-reality. Everything is as close to reality as we can get. So you have some believably with that. I think that's also a sort of anchor point: let's keep it grounded. And, for comedy, and some of the effects and design (with our production designer who made the time machine) you want to help them find a way to make it as real as you can get. I do think that was a really good approach. In terms of this particular movie, I think all good time travel movies have a philosophy behind them. What would you say is your time travel philosophy? I think the time travel philosophy is that you can't control the universe. Even with the most power, you can't control it. You can't control who loves you. And who you love. And you can't control the vulnerability which comes with loving somebody. You can't protect yourself against that. You lean into it. Even with all the power in the universe. That's true. Is there anything else you would like to add about the project? Any other future projects? Yeah. You know, I would like to say that as I think about this and think about the DVD release, we talked a lot about getting the movie made. I think I am so grateful to Ray Mansfield and Matt Rhodes, who are the producers who got this movie made. Now I get to be on the phone with you and talk about this movie and filmmaking in general. It was just so hard to get it made. Without Matt and Ray I wouldn't be talking to you. I kept reading the script over and over again hoping that I would have an opportunity. I am so grateful to them. On that note, I really enjoyed this film. It's a really excellent time travel themed comedy-romance. I think you did a really good job. I really enjoyed getting to experience that. I hope you continue to make future projects. Thank you so much, I really appreciate that. I appreciate you taking the time to say that, it's very nice. Time Freak is now available on Blu-ray, DVD, and streaming platforms.